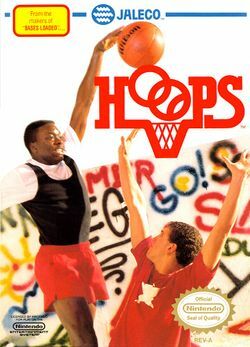 Hoops is an NES basketball game that was released in 1988 for a Japanese audience and in 1989 for a North American audience. In Japan, the game is known as Moero!! Junior Basket - Two on Two (燃えろ！！ジュニアバスケット ツー オン ツー, Moero!! Junior Basket - Two on Two?) as part of "Moero!!" sports series, which includes Bases Loaded. The game is done in a half court style with the player having a choice to disable or enable winners outs. No fouls are called. There is also an around the world mode that allows players to focus on making baskets without worrying about the charging, pushing, and traveling fouls that are found in the standard mode of play. Characters in the game consist of Mr. Doc, Jammer, Barbie (no relation to the fashion doll), Face, Bomber, Zap, Legs, and Wiz. This page was last edited on 11 March 2015, at 02:54.